Ingestion of degrading ocean plastics likely poses a substantial risk to the survival of post-hatchling sea turtles because the particles can lead to blockages and nutritional deficiencies, according to new research from Loggerhead Marinelife Center and the University of Georgia. This puts the survival of all sea turtle populations at risk, because sea turtles may take decades to become sexually mature. The study also suggests that micronizing plastics could have tremendous negative implications for the ocean's food web. "We may be in the early phases of the first micronized plastic waste-associated species population decline or extinction event," said co-author Branson W. Ritchie, a veterinarian with more than 30 years of experience in exotic and wildlife medicine and the director of technology development and implementation for the UGA New Materials Institute. "But, an even bigger issue is what micronizing plastics are doing to the ocean's ecosystem. As ocean plastics continue to micronize, smaller and smaller particles are being consumed by the smallest creatures in our oceans, which compromises the entire food chain, because the plastic in these animals inhibits their ability to uptake the nutrients they need to survive. If the level of mortality we have observed in post-hatchling sea turtles also occurs for zoo plankton, baby fish and crustaceans, then we will witness a complete disruption in our ocean life cycle." 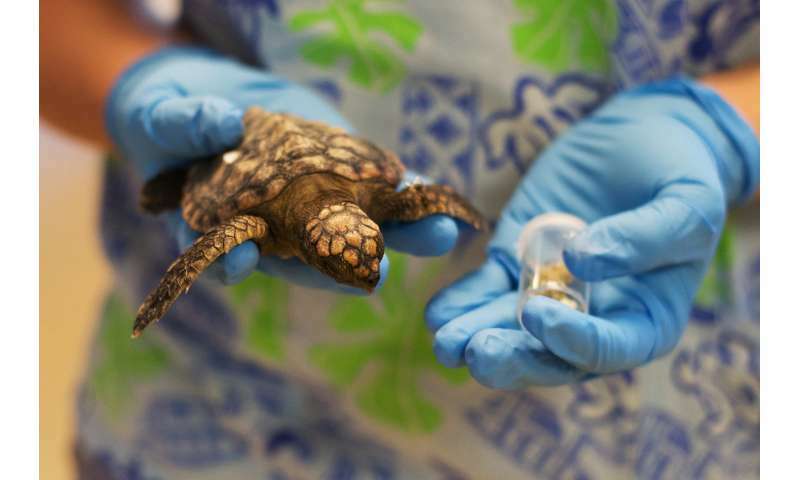 The researchers collected 96 post-hatchling sea turtles that had washed back onto the beaches along a stretch of Florida's coastline between Vero Beach and Lake Worth. The area is just south of the Archie Carr National Wildlife Refuge, named for the researcher who spurred the sea turtle conservation movement, and is part of the largest rookery in the United States for loggerhead and green turtles. More than 90 percent of the U.S. loggerhead population nests in Florida, said study co-author Charles Manire, a veterinarian who is director of research and rehabilitation for Loggerhead Marinelife Center. "Sea turtles are known to mistake ocean plastics for prey, like crab or fish eggs, or in the case of larger sea turtles, floating plastic bags for jellyfish," Clark said. "Our findings suggest that far fewer post-hatchlings may be surviving long enough to reproduce. This has devastating implications for the seven species of sea turtles struggling to survive," said Manire. "If other sea turtle populations are experiencing similar mortality rates, we predict that there will be insufficient numbers of sea turtle hatchlings reaching sexual maturity to offset natural and other human-associated losses." "We found particles ranging from millimeter-sized fragments to nanoparticles that measured on average 52 nanometers, and the smallest fragments we found measured 5 nanometers," said Jason Locklin, director of the UGA New Materials Institute and a co-author on the study. "The smaller these particles are, the more unstable they become." "Of these larger mesoparticles, 54.1 percent of what we found were polyethylene and 23.7 percent were polypropylene," said lead author Evan White, an assistant research scientist at the New Materials Institute who analyzed the particles. "Polyethylene is the most common plastic and is primarily used for packaging, especially food packaging. Polypropylene is the second most-commonly produced plastic and has a wide variety of uses, including food packaging." The study team also included Shunli Wang, of the New Materials Institute, and UGA undergraduate Benjamin Crawford. The study, titled "Ingested Micronizing Plastic Particle Compositions and Size Distributions within Stranded Post-Hatchling Sea Turtles," was published in Environmental Science and Technology.